I got to try this at a tasting at Nørrebro Bryghus among quite a few others. Most of the other bottles didn't catch my eye, but with Halloween on my brain so much lately, this one definitely did. It's a simple design, but you gotta admit there's some badassery there. 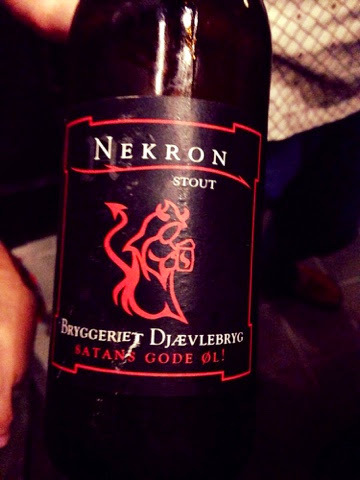 The brewery name translates to "devil's brewery" with "damn good beer" written underneath it, and apparently they donate some of the proceeds from their beer sales to the Danish Atheist Society. So what does sin taste like? My first impression was chocolate and steak. Sounds pretty accurate, if you consider decadence to be one of the perks of siding with the devil. After a couple more sips, the smooth smokiness took over the more delicate flavors, but it was still a devilishly good drinking experience.